When artist and musician Sally Taylor was diagnosed with dyslexia as a child, she needed a way to decode words and information beyond language. Her mother (musician Carly Simon) encouraged games of metaphor and perspective. Years later, these same tenets drive her project Consenses, an artistic game of “Telephone” that has engaged artists from around the world, of every medium and genre. The latest podcast in MCC’s Creative Minds Out Loud series features Taylor in conversation with MCC Executive Director Anita Walker, exploring how the project opens up new perspectives about the world around us. What is the nature of inspiration? How do we as humans interpret and translate our inspiration? Listen to the discussion. Creative Minds Out Loud is the Massachusetts Cultural Council’s (MCC) podcast featuring informative and lively conversations with arts and culture leaders. Recent episodes feature Diane Quinn of the American Repertory Theater, Laura Jasinski of the Rose Kennedy Greenway Conservancy, and Jane Chu of the National Endowment for the Arts. Listen and subscribe now. 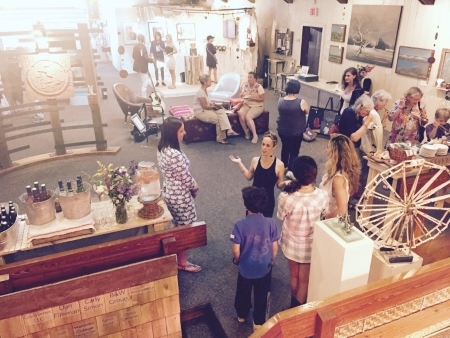 Image: from an exhibition of the CONSENSES project, which debuted in Martha’s Vineyard in 2014.